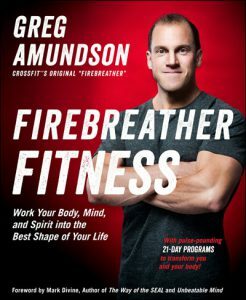 Firebreather Fitness is Greg Amundson’s high-impact fitness program for new athletes, veteran sports enthusiasts, coaches, law enforcement, military personnel, and anyone interested advancing the quality of their life. Firebreather Fitness programs are based on sound science, the practices of influential fitness and thought leaders, current research, and Amundson’s years of experience inspiring high performance from athletes and warriors–physically, mentally, and spiritually. Packed with practical advice and vetted training methods, Firebreather Fitness will help you align your physical, mental, and spiritual training so you can excel at work, in the gym, and in life. Greg Amundson is known in CrossFit as the “Original Firebreather”. He is a former SWAT officer, DEA Special Agent, U.S. Army Captain, and founding CrossFit athlete and coach. Amundson is a globally recognized leader in functional fitness conditioning and anti-aging and anti-inflammatory foods and diet. In his book, he shares his advice, experience, and education on how to live a great, balanced and super-healthy life.